We’ve had a great response on the last “let’s pin down Matt for 5 minutes” interview where we found out about what was happening with the Diesel Electric simulation and our plans for the future. You've asked for more and so we’re going to aim to get a more regular flow of articles coming out to show you more about what's going on behind the scenes. Today, I spoke briefly with Matt about where things are on the Diesel Electric simulation update in follow-up to last month’s article. Matt, we've seen really positive feedback on the locomotives included in West Somerset Railway, particularly around the new simulation physics. How has it gone from your perspective? The team were really keen to see how people responded to the new physics simulations on the Class 47 and Class 09 locomotives that are included in West Somerset Railway. The feedback has been really good and it's been interesting to see people falling foul of some of the interesting new characteristics that the simulation brings. One area in particular is where you find sometimes when you apply power nothing happens on the ammeter. The brief explanation for what is happening here is that when you close the power handle you should hang around in the "on" state for a few seconds before moving to "off", because it allows the internal systems that manage the loco to wind down the power correctly. If you drop straight to off and then go back on the power again, you'll find it's all disabled and no amps will get to the motors, simply go back to off and wait a few seconds before re-applying the throttle. Very simply, you're just waiting for an internal control to descend to zero which will then reset to allow power to apply next time you move the throttle handle. Armed with this knowledge, we find it changes how you drive in a small way, which is cool and exactly what the detailed simulation in SimuGraph® is all about surfacing. Below are full resolution exports of the SimuGraph diagrams for the Class 47 and Class 09, just click on the thumbnail to open the diagram in its full glory - warning, they’re big. We’ve zoomed them in so that you can read all the text and maybe start to see some of what’s going on in a full locomotive simulation. 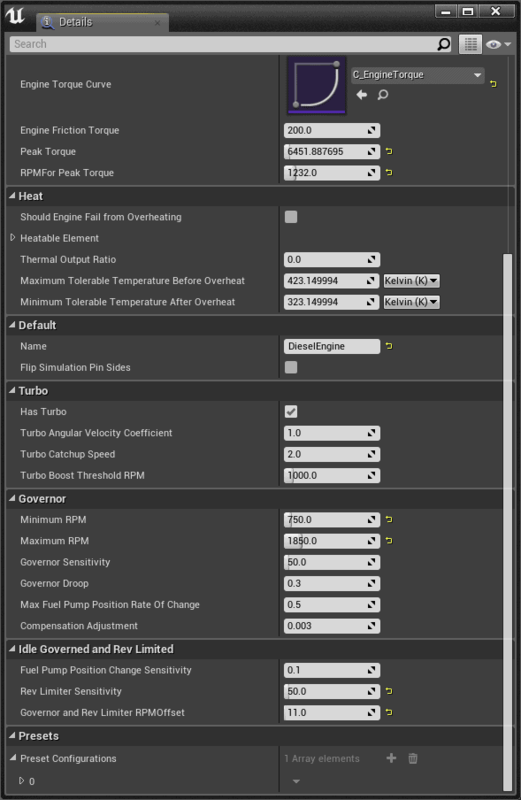 It’s also worth knowing that within each of those components in a SimuGraph diagram there are some properties that allow you to configure it, some of the properties from the Diesel Engine component are shown below. 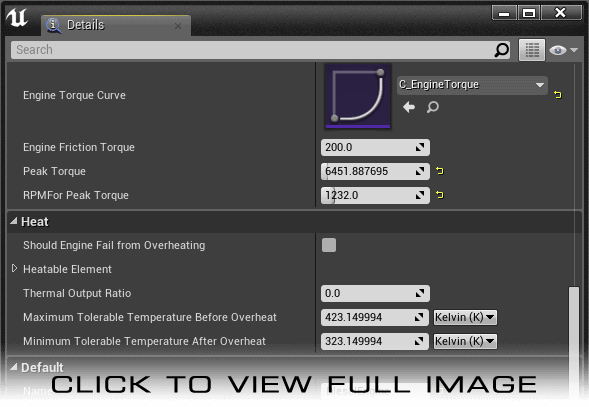 Note that some of these properties, such as “fail from overheating” are placeholders for the future. The engineering team are always thinking ahead to how core components may be developed in the future, even if they aren’t ready to be used in production releases yet. Another interesting property shown is the “presets” section. This addresses quite a complex issue, if you have a relatively complex physics setup for the power and braking systems, how do you actually start the game without having to power it all up from cold? Our preset system means that we can get the vehicles in to a specific state such as being ready to go but brakes applied, and then preserve every value from a running system to be instantly reinstated when the game starts. We promised last month that we’d update on the Diesel Electric Simulation work, what's happening with the work to back-port this work to the earlier locomotives that we've produced? The team are busy on lots of projects but we’re working hard to get through the locos as fast as possible. We have the Class 66 in an advanced state of development and the team are starting to think about the Class 43 HST in amongst working on new locomotives that we need for upcoming route products. One of the new unannounced locomotives that the team is working on has ended up giving us most of the SimuGraph improvements needed to be able to deliver a much better dynamic brake experience on the CSX locomotives, when we are ready to get to them. If you recall, in the previous article I described how this would be a larger chunk of work that differentiated the US from the UK trains and it's good to see that this is already well on the way even without specifically working on those locomotives yet. In the same spirit as the SimuGraph diagrams for the Class 47 and Class 09 from above - here’s the fully expanded version from the updated Class 66 simulation. Note: Dynamic braking system tech in an advanced stage of development, providing a head start on the work required for all of the above locos. 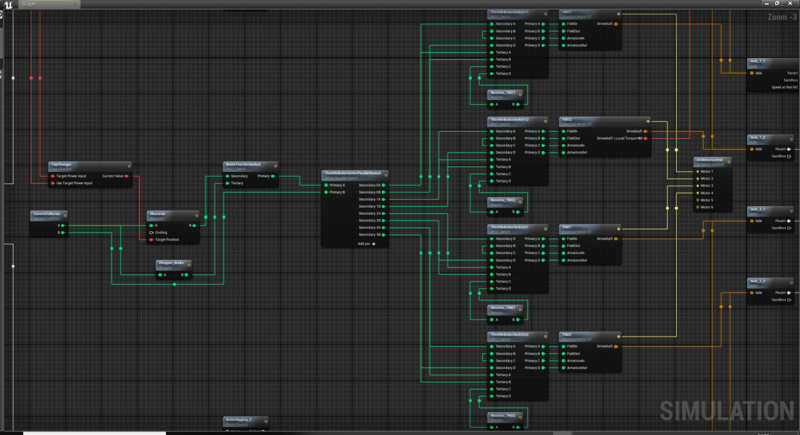 Here’s a grab from part of the SimuGraph setup from a currently unannounced locomotive from a product in development. It demonstrates how switchgear and resistors are now added to the new traction motor circuitry and are used for electric / dynamic braking purposes. This will feed in nicely to the future work on getting the CSX locomotives upgraded with the new physics setup. 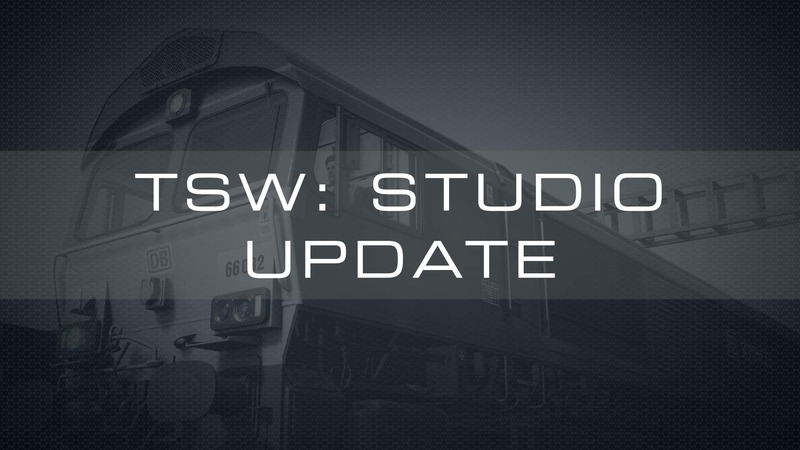 We'd like to thank Matt for taking the time to once again share details on the upcoming diesel-electric simulation improvmements, and we'll be back next month with another update on what's going on in the Train Sim World Studio!